Yossi Milo Gallery is pleased to present the first New York solo exhibition of works on paper by Nathalie Boutté. The exhibition will open on Thursday, September 7 and will be on view through October 21, with an opening reception for the artist on Thursday, September 7 from 6:00 – 8:00 pm. Nathalie Boutté’s (French, b. 1967) handmade collages embrace photography, sculpture and painting. Using colored paper and a meticulous cutting and pasting process, the self-taught French artist creates mesmerizing re-interpretations of historic photographs. While appropriation is an essential part of Boutté’s work, the artist veers from her source material, breaking down and building back up the original image and its traditional interpretation. Crossing-over will feature 22 of Boutté’s most recent collages comprised of thousands of small strips of Japanese paper cut by hand and assembled into feathery rows. Sometimes burned, shaded with ink or covered in typed letters,the paper’s tint accounts for the details in each image. Theartist’s exclusive use of handcrafted cutting and pasting techniques is largely influenced by her graphic design background, having studied in a pre-digital era when mechanical pencils, rotrings and cutters were the primary work tools. The source material informs each created work: the look of a Daguerreotype is simulated using off- white or sepia paper, while white and brightly hued sheets mimic an Autochrome’s vivid colors. While abstract up close, at a distance the strips combine to replicate iconic images such as Malian photographer Seydou Keïta’s famous portrait, Man Holding a Flower , or Russian writer Leonid Andreyev’s portrait of his son as a sailor. Through her research into early photographic archives and her literal and metaphorical blurring of traditional portraiture, Boutté’s works expose and interrogate representational biases of the time. 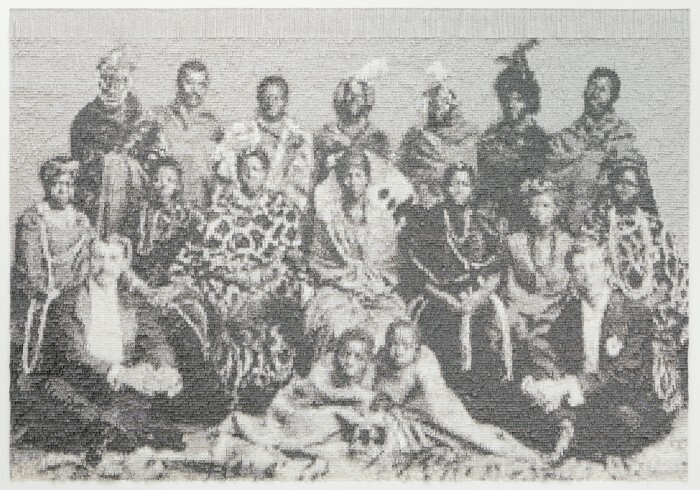 In African Choir , based on an 1891 photograph in the Getty Images' Hulton Archive, Boutté questions the Victorian depiction of foreigners and heathens. In portraits such as La poupée or Les fillettes , a purposeful distortion and a softening of certain details in human characteristics seem to defy traditional ideals of childhood, family structure, and womanhood and masculinity. The artist’s portrait, Peter the Great III , sheds light onto the history of Black and Native American representation in art. The descendant of a freed slave, Australian heavyweight champion Peter Jackson was one of few extensively photographed Black athletes of his time. Eschewing photography’s representational qualities and sharpness, Boutté layers new meaning on top of former depictions of her subjects, adding both literal and figurative dimension to the histories contained within each image. Nathalie Boutté’s work has been presented in exhibitions at the Bellevue Arts Museum, WA; Lesher Center for the Arts, San Francisco, CA; Domaine de Chamarande, France; Institut d’Art Contemporain, Villeurbanne, France; Centre photographique - Pôle Image Haute-Normandie, Rouen, France and Museum Rijswijk, The Netherlands, among others. In 2018 and 2019, her work will tour at the Huntsville Museum of Art, AL; Pensacola Museum of Art, FL; Ellen Noel Art Museum, Odessa, TX; Foosaner Art Museum, Melbourne, FL; Amarillo Museum of Art, TX; Leigh Yawkey Woodson Art Museum, Wausau, WI and Art Museum of West Virginia University, Morgantown, WV. Boutté is the 2012 recipient of the Kristal Prize from the Salon de Montrouge, France. The artist was born in 1967 in Senlis, France and currently lives in Montreuil, France.